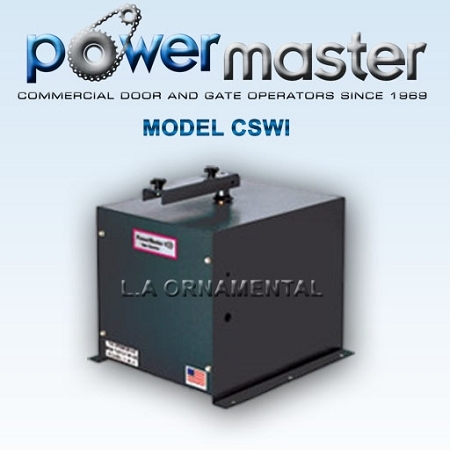 The CSWI is designed for use on gates with a maximum weight of 1800 pounds and a maximum width of 30 feet. The gate will travel from open to close in approximately 13 seconds and is rated for a maximum of 45 cycles per hour. The CSWI is available from 1/2 1-2 HP in single for three phase. The drive arm is easily disconnected for manual operation in case of power failure. This unit is UL 325 listed for use in Class 1 through Class IV applications. Heavy duty #7 Ga. Steel frame providing a strong and durable unit. Timing belt primary reduction for smooth, quiet and positive operation. Heavy duty 45:1, oil bath type gear reducer for long service and dependable operation. Heavy duty #50 sprocket and roller chain arrangement for final drive reduction. Drive arm easily disconnected for manual operation in case of power failure. Easily adjustable limit switch cams for precision gate positioning. Soft start and stop at the open and close limits of travel, due to the inherent geometry of the articulating drive arm linkage. Pad mounted for a strong, solid installation. Available horse power: 3/4 HP. Maximum gate weight: 1800 LBS. Maximum gate width: 30 feet. Gate speed: 13 seconds from open to close. Slow Speed Option (18 sec. From open to close). Super Slow Speed Option (23 sec. From open to close).